Arne Pommerening's Webblog on Forest Biometrics and Quantitative Ecology | This is a site for facilitating an exchange on current issues in Forest Biometrics, Quantitative Ecology, Plant Growth Analysis, Woodland Structure and Theoretical Forest Science. The potential-modifier approach was first published by Newnham (1964) and Botkin et al. (1972) as part of empirical and so-called gap models. Potential growth defines an upper limit of growth for a given species on a given site. This avoids unrealistic model estimations, as can be the case when estimating AGR directly from plant size, interaction and factors of the abiotic environment. Usually only the model parameters of the function defining potential growth change when adapting the model to new species and sites whilst the parameters relating to the modifiers stay the same. This increases the robustness of the overall growth model and allows easier adaptations. 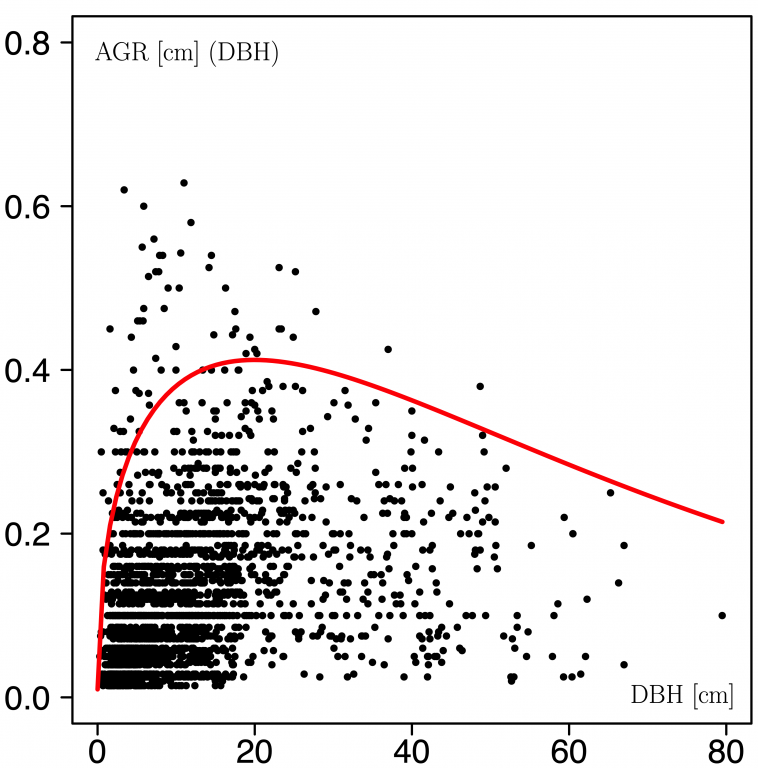 Measurements from the above-mentioned open-grown trees can be used for defining potential AGR. However, since this involves substantial additional sampling efforts, another strategy is to apply quantile regression (Koenker and Park, 1994; Cade and Noon, 2003) to the data collected for parametrisation. 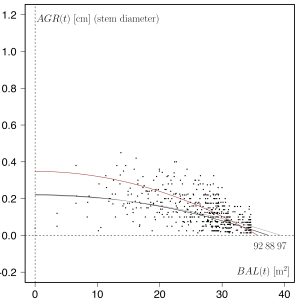 Quantile regression is not so different from conventional regression. Instead of fitting functions of the usual 0.5-quantile of the observed data (mean regression), larger or smaller quantiles are selected. For the application to the potential-modifier approach usually upper quantiles of 0.95 or 0.975 are used. where y in this case is tree stem diameter but otherwise could be any plant size characteristic. A, k and p are model parameters. Cade and Noon (2003) noted that quantile regression also has a general place in data analysis providing a more complete view of possible causal relationships between variables in ecological processes, where mean regression techniques would fail to identify relationships between explanatory and response variables. The additional advantage is that one can directly estimate rate parameters for changes in the quantiles of the distribution responses conditional on the predictor variables. Botkin, D. B., Janak, J. F., Wallis, J. R., 1972. 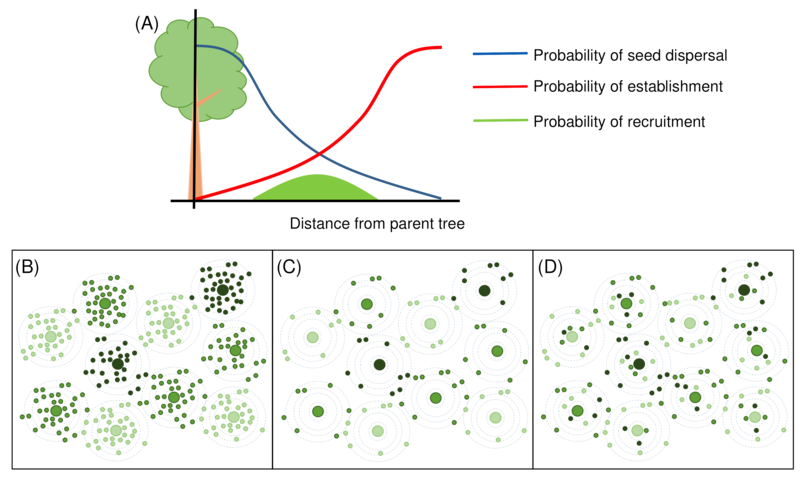 Some ecological consequences of a computer model of forest growth. The Journal of Ecology 60: 849. Cade, B. S., Noon, B. R., 2003. A gentle introduction to quantile regression for ecologists. Frontiers in Ecology and the Environment 1: 412-420. Koenker, R., Park, B. J., 1994. An interior point algorithm for nonlinear quantile regression. Journal of Econometrics 71: 265-283. Pienaar, L. V. and Turnbull, K. J., 1973. The Chapman-Richards generalization of von Bertalanffy’s growth model for basal area growth and yield in even-aged stands. Forest Science 19: 2-22. Pommerening, A. and Muszta, A., 2016. Relative plant growth revisited: Towards a mathematical standardisation of separate approaches. Ecological Modelling 320: 383-392. Newnham, R. M., 1964. The development of a stand model for Douglas fir. Ph.D thesis, University of British Columbia, Vancouver, 201p. 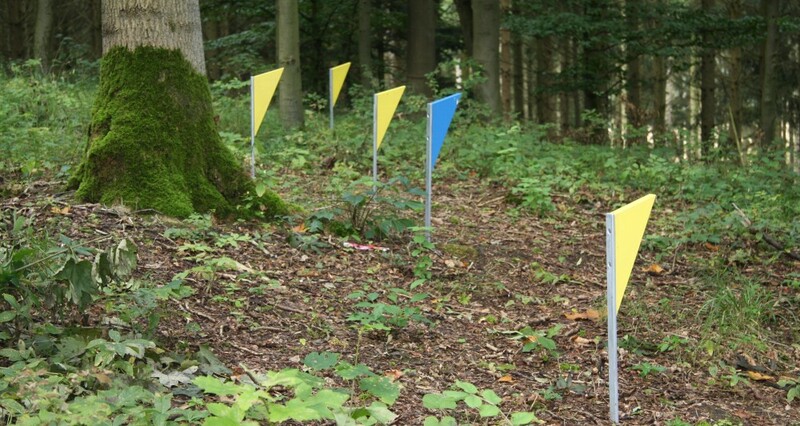 Forest biometrics – what lies ahead? Forest biometrics is a newcomer in forest science. It modestly started off as forest mathematics at different places in Europe and North America some 100-150 years ago for teaching a minimum of essential quantitative skills. As many academic fields initially it was supposed to fill a support role for the engineering parts of forest science teaching and research. However, since the 1960s/70s this view started to become increasingly outdated and the subject area successfully established itself at most universities as a research field in its own right in the same way as other disciplines. Some chairs in forest biometrics have since then specialised on forest growth and yield modelling or general statistics. With some notable exceptions this is typically the case in North America. In Europe, however, there is an increasing trend for forest biometrics to play an important role in quantitative ecology and ecosystem modelling. This niche is also partly occupied by other research institutions outside forest science and the collaboration with these has been very fruitful and inspiring. The Forest Faculty at SLU was recently ranked as a leading international forest science institution. As a professor representing SLU this was really nice to read. The Faculty has surely deserved this for all their hard work and at the same time ours is one of the last few forest science only faculties in Europe. In 2024 SLU will host the IUFRO world congress at Stockholm, the birthplace of the SLU Faculty of Forest Sciences and next year we will launch a new MSc degree in Forest Ecology and Sustainable Forest Management. Along with other academic fields forest biometrics has an important role to play to help the Faculty to maintain this position in the world. To strengthen forest biometrics and in recognition of the achievements of the current chair, the professorship in forest biometrics at SLU recently moved from the Department of Forest Resource Management to the Department of Forest Ecology and Management. The chair has received a warm welcome at the new department and I am most grateful to my new colleagues. I will continue my research in individual-based methods of forest ecology involving point process statistics, individual-based modelling, tree growth analysis and the analysis of interaction between humans and trees. The organisational change reflects current trends elsewhere in Europe and allows a better integration of quantitative ecology in the wider academic field of forest ecology. SLU therefore have made an important decision towards shaping the future of forest science and maintaining its mission in Sweden, Europe and the world. Important starting point for analyses in point process statistics. Empirical size distributions can be produced using histograms and bar plots. These approximate the probability density function, which can be modelled using for example the Weibull distribution model but also the beta, gamma or normal distributions. These are parametric models and there is also the possibility to produce non-parametric trend curves based on kernels. In that case no particular model assumptions are made and applying non-parametric trend curves is a good strategy for initial data exploration to prepare the selection of suitable parametric models. All of these methods and models have in common that they provide static information about size distributions. However, size distributions are dynamic and we are often interested in how these size distributions change with time. Of course, it is possible to model populations bottom-up at the level of individuals and then to summarise each simulation step by size distributions. Often the dynamics of the size distribution itself is of interest, researchers and stakeholders are, for example, interested in the demographic processes of certain size variables. This research approach is then closely related to other demographic studies, e.g. in animal or human populations. Typical processes involved in a dynamic size distribution are shown in the schematic graph below. Back in the early 2000s silviculturists in the UK were very interested in these dynamic size distributions for deriving thinning guides for Continuous Cover woodlands. I remember well that I first started to discuss them in greater detail with Hubert Sterba (BOKU University, Vienna), when he first visitied me at Bangor University in 2002. In 2012 I had the opportunity to exchange views with Jean-Philippe Schütz (ETH, Zürich) whilst working in Switzerland. In Schütz and Pommerening (2013) we used such a demographic approach to model the equilibrium conditions for a Douglas fir single-tree selection system in North Wales. The equilibrium conditions were identified in this work to inform and guide forest management. The Douglas-fir plots in Artist’s Wood (Gwydyr Forest) in North Wales have always been my favourites during my time at Bangor University and Jean-Philippe and I intended to provide evidence that single tree selection systems are possible with Douglas fir. The modelling approach was based on Schütz (2006). Brzeziecki et al. (2016) refined this approach and applied it to natural stands in Bialowieza Forest, where no forest management takes place. Here our research objective was to model equilibrium size distributions for the main tree species, in order to find out about future species composition trends as a contribution to current discussions about this important virgin forest. The modelling approach is simple and effective. 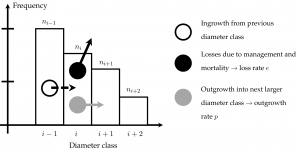 As an important component it is (1) necessary to model the outgrowth rate for each diameter class . 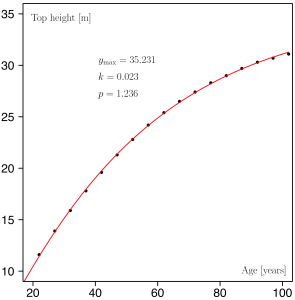 This is a function of (2) size-dependent absolute growth rate , which needs to be modelled in the next step. Finally (3) size-dependent mortality rate has to be determined. Here and . Using such a dynamic size-class model many questions in population ecology and forest management can be answered. There have been many alternative models such as the -factor model and its derivatives (see for example Cancino and Gadow, 2002), but they have been found to be too inflexible and not based on real, observed growth and mortality processes. Brzeziecki, B., Pommerening, A., Miścicki, S., Drozdowski, S. and Żybura, H., 2016. 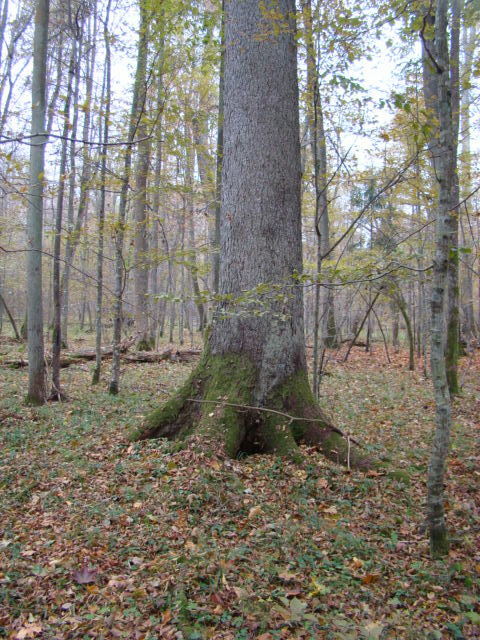 A common lack of demographic equilibrium among tree species in Białowieża National Park (NE Poland): evidence from long-term plots. Journal of Vegetation Science 27, 460-469. Cancino, J. and Gadow, K. v., 2002. Stem number guide curves for uneven-aged forests development and limitations. In: Gadow, K. v., Nagel, J. and Saborowski, J. (eds. ), 2002. Continuous cover forestry. Assessment, analysis scenario. Kluwer Academic Publishers. Dordrecht, pp. 163-174. Schütz, J.P., 2006. Modelling the demographic sustainability of pure beech plenter forests in eastern Germany. Annals of Forest Science 63, 93-100. Schütz, J.P. and Pommerening, A., 2013. Can Douglas fir (Pseudotsuga menziesii (Mirb.) Franco) sustainably grow in complex forest structures? Forest Ecology and Management. 303, 175-183. Reconstruction is commonly understood as the process and the result of re-establishing something that (at least partially) does not exist any longer or of re-establishing the unknown. There are a range of established reconstruction techniques for example in archaeology, in forensics (e.g. face recognition), in medicine (e.g. implants) and computing (data reconstruction). Also statistical imputation, i.e. the process of estimating missing observations and spatial interpolation in geostatistics are related to reconstruction. Without doubt reconstruction is a fascinating research field with many different applications. Another important, more ecological application is the reconstruction of spatial forest structure. All data, that are collected in forest ecosystems, have a temporal as well as a spatial dimensions. The properties of the whole forest ecosystem, e.g. wood production, habitat and recreational values, to a large degree depend on the underlying ecosystem structure, particularly on its microstructure. This microstructure is typically shaped by physiological and ecological interactions, but the microstructure also influences interactions. These structure-property relationships play a crucial role in providing ecosystem goods and services and in the maintenance of biodiversity. Usually data related to spatial forest structure are available only on a sample basis but subsequent research requires full information which then needs to be reconstructed. Reconstruction can even be employed for habitat modelling: Imagine a set of summary statistics that well describe requirements of a certain, endangered animal species. These can then be used to modify an existing landscape at the computer to meet these requirements. In considering this option, we have actually moved on from reconstruction to construction, because an active change of landscape structure is modelled. Bäuerle and Nothdurft (2011) used spatial reconstruction to model habitat trees. Another important purpose of reconstruction is the testing of competing summary characteristics. There are usually a number of statistics describing the same aspect of spatial forest structure or of a certain material. Which one is better, which one should be used in a given analysis? One way of shedding light into this is by reversing the analysis. The competing summary characteristics are used in separate simulations for reconstructing the original data from the results provided by these summary characteristics. This synthesis of a given analysis is nothing else than reconstruction and is applied a lot in materials science. Well, it turns out (re)construction is not difficult at all. First you need one or more summary characteristics describing the structure you intend to reconstruct. This can be a simple index based on a mean, it can be a histogram or a function. You can also choose a number of different summary characteristics. Then you select a stochastic optimisation method. For this other researchers and I have successfully used the simulated-annealing method. This method was first developed in physics, it relates to thermodynamics, particularly to how the energy state of for example metals change when they anneal. The reconstruction algorithm is based on simulated annealing. One way to start is by randomly dispersing tree locations in a given observation window. Then iteratively one of these points is randomly selected and shifted to a new random location within the observation window. For this change the summary characteristic(s) are re-calculated and compared with a target, e.g. the same summary characteristic for some ideal of a reference. If the change leads to a better approximation of the target, it is made permanent otherwise it is rejected and the old state is restored (improvements-only algorithm). In either case, this is followed by the random selection and shift of another point. This process stops when the difference between target and observed characteristic(s) becomes very small or after a certain number of iterations (Torquato, 2002). In previous publications I employed this method to reconstruct the structure of a whole forest stand from sample data by interpolating the unmeasured structure between the sample plots (Pommerening and Stoyan (2008). This even let to the astonishing result that in some cases certain summary characteristics were better estimated from the reconstruction than from the sample although no additional information was added. Nothdurft et al. (2010) in fact corrected a biased sampling design through spatial reconstruction. Together with Estonian colleagues we also used reconstruction for simulating off-plot edge correction buffers (Lilleleht et al., 2014). It is also possible to include existing, measured objects in the reconstruction through conditional simulation (Pommerening and Stoyan, 2008). On my website pommerening.org you can find example code in R and C++ for construction, where you can essentially model a spatial point pattern that leads to a certain pre-set value of the aggregation index by Clark and Evans. Along similar lines it is also possible to set a certain species mingling index (see one of my previous blogs) for an existing point pattern and then to swap pairs of trees of different species. Here the point locations remain the same, only the species marks are re-allocated (see below for some results). Applications to remote-sensing and other image data are also known. There is no limit really to anybody’s resourcefulness to invent new ways of spatial reconstruction. Example of species mingling construction: A random point pattern was simulated using a Poisson process in a window of 100 x 100 m. The two species (red and yellow were randomly assigned to the points with a probability of 0.5, left). 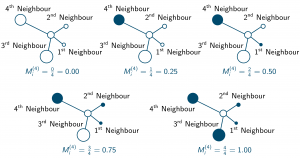 Through construction the species dispersal was optimised to achieve a mingling index J of -0.20, where among the four nearest neighbours heterospecific points attract each other (right). Note that the point locations have remained the same. Interested? Any questions? Don’t hesitate to get in touch. Bäuerle, H. and Nothdurft, A., 2011. Spatial modeling of habitat trees based on line transect sampling and point pattern reconstruction. Canadian Journal of Forest Research 41, 715-727. Lilleleht, A., Sims, A. and Pommerening, A., 2014. Spatial forest structure reconstruction as a strategy for mitigating edge-bias in circular monitoring plots. Forest Ecology and Management 316, 47-53. Nothdurft, A., Saborowski, J, Nuske R. S. and Stoyan, D., 2010. 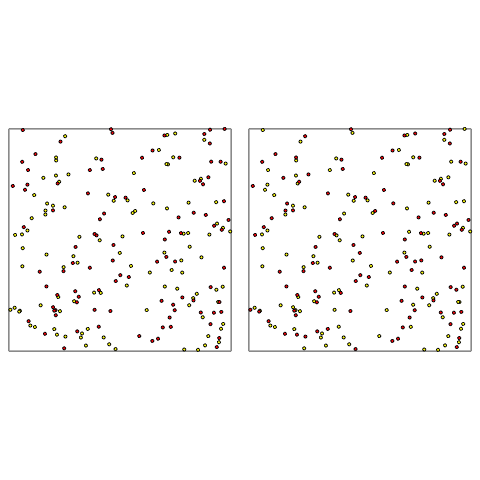 Density estimation on k-tree sampling and point pattern reconstruction. Canadian Journal of Forest Research 40, 953-967. Pommerening, A. and Stoyan, D., 2008. Reconstructing spatial tree point patterns from nearest neighbour summary statistics measured in small subwindows. Canadian Journal of Forest Research 38, 1110–1122. Torquato, S., 2002. Random heterogeneous materials. Interdisciplinary applied mathematics 16, Springer, New York. Tscheschel, A. and Stoyan, D., 2006. Statistical reconstruction of random point patterns. Computational & Data Analysis 51, 859-871. Many scientific papers deal with aspects of plant interactions including competition and facilitation. It is very likely that plant interactions play an important role in structuring our ecosystems and this is indeed a prolific research field that has kept many researchers busy for the last hundred years. In the absence of a deeper understanding of the physiological mechanisms involved in interactions, plant performance (in terms of growth and yield) was often used as an indicator of plant interaction patterns. Given the same environmental conditions, a lack of performance may be an indicator of competition and surplus performance may indicate dominance or facilitation, but this does not always need to be the case. Stem growth of trees can, for example, be considered a performance variable. A common assumption based on ecological theories is that trees with few competitors, i.e. growing in quite open conditions, respond more in terms of growth than those that grow in tight neighbourhoods. Research in tree mechanics, however, suggests that what is interpreted as competition effects, has more to do with a tree’s need to adjust to environmental challenges, particularly to withstand the forces of wind. A tree protected by neighbouring trees in a tight neighbourhood does not need to invest much in stem growth because it is sheltered from the wind, whilst another tree growing in more open conditions is strongly affected by wind. Considering this the growth response merits a very different interpretation. Promising research is currently underway attempting to uncover the physiological receptors and processes related to interaction. This will undoubtedly put us into a better situation to review and select appropriate criteria for identifying the mode and intensity of interactions. In this context, individual-based models assume an important role in exploring plant interactions. This model type is in fact specialised on handling interactions between individuals or agents. The behaviour of a system, for example a forest ecosystem, is the result of individuals acting and interacting in a given environment. The same applies to the projection of growth or mortality, which no longer is the result of statistical estimations but a consequence of individual “decisions” and interactions. Thus following this modelling philosophy interaction is handled in a very mechanistic way and can also be linked with physiological receptors and processes. Individual-based modelling is also very intuitive and creative. Many software packages such as NetLogo and the Java Agent-Based Modelling Toolkit have been developed to support this modelling approach, however, R and Python are also good choices to begin with. Individual-based modelling is not limited to any particular field of science and shares interesting links with physics and point process statistics. An excellent opportunity for exploring the world of A/IBMs is a workshop that my group is offering at Umeå (Sweden) on 21/22 August 2018, see our workshop website. In this workshop we will have a few keynote talks followed by talks of the workshop participants. Every participant can highlight anything they consider important, e.g. why they are interested in IB modelling, what they perceive as challenge or programming problems they ran into and want to share. The workshop is not limited to any particular ecosystem or agent and I believe the exchange across (eco)systems and specific applications can be very inspiring and eye-opening. If you haven’t signed up yet please consider the opportunity and get in touch! It often occurred to me that it is a pity to be able to read finished research papers only. As we all know, they have to be very concise and can only report a selection of the most positive outcomes of everybody’s research. However, this is only the tip of the iceberg, isn’t it? There usually is much more to it. Much delight, of course, but also struggle, much frustration when the results turn out a different way than expected or when the reviewers fail to see the point of the paper. In fact in summer this year I have received an interesting email where an eminent researcher stated: “It seems crazy, but my experience has been the more novel my ideas, the more likely they are to get rejected from publication.” Many of his colleagues responded to this by saying: “Me too”. I think this is encouraging and disappointing at the same time. It highlights one of the failures of the current peer-review system but also tells us that we have to try even harder to tell the fascinating stories of our research. Every research usually has quite a bit of background history that doesn’t get published. Of course, not every single bit of our research is a hit and may be as fascinating as the discovery of the DNA double helix by Watson and Crick. But still, I am sure that there are a great deal of fascinating background stories that would make our lives richer, if they were actually told. Imagine what encouragement and boost in inspiration this could potentially give to young researchers and particularly to PhD students! In this spirit, feeling committed to my own appeal, I would like to say a few words on our recent paper “Do large forest trees tend towards high species mingling?” published in Ecological Informatics. The story of this paper probably started off during my field trips to Bialowieza Forest in 2011 and 2016, when Bogdan Brzeziecki and his colleagues from Warsaw University of Life Sciences kindly showed me a number of forest sites where a species change has occurred and large remnant trees of the previous woodland community were dominating clusters of different species (see the photo below showing a remnant Norway spruce in a cluster of young hornbeam trees). The image of these remnant trees somehow stuck in my head, thank you Bogdan, and kept me thinking about the possible underlying processes that let to this situation. Then in October 2016 I was reviewing somebody else’s manuscript that was submitted for publication. In this work, the author hinted that there may perhaps be a tendency of larger forest trees to be surrounded by heterospecific neighbours in mixed species forests. This really was the trigger and the hint somehow struck me like a lightning: I thought by myself that this would actually be a fascinating research question. I shoved the review papers onto another pile of papers on my desk and dug a bit deeper into ecological theories. From earlier I recalled the Janzen-Connell hypothesis, the herd immunity hypothesis and size-hierarchy processes that describe natural processes of maintaining species coexistence and biodiversity. One observation in many natural plant populations is that self-thinning leads to local size hierarchies (also referred to as size inequality), where heterospecific stands include dominant trees emerging from a first colonisation cohort, which are often surrounded by patches of smaller sized trees of the same cohort. Small trees of these early colonisers are initially often of the same species as the dominant trees and according to the mechanisms of both the Janzen-Connell and herd immunity hypotheses later decrease in numbers due to self-thinning processes. Eventually the small early colonisers are partially or completely replaced by even smaller individuals of other species from subsequent colonisation cohorts. This combined effect of species and size replacement enforces both local size hierarchies and the mingling of different tree species in a given area or patch and prevents the development of monocultures (see B-D in the figure below). With every new paper that I discovered on this subject the story and research question got even better. It was like tasting new wine all the time. Finally it became clear to me that it would be interesting to study this question for a wide range of different forest types in the temperate and boreal climate zones across the world. In terms of the aforementioned ecological theories, forest ecosystems in these climate zones have to date not been as intensively studied as tropical forest. It took me a while then to devise a good method for proving the point that there is a trend for larger forest trees towards high species mingling. At first I was thinking about using so-called second-order characteristics from point process statistics. I tried a few things there, but none of the outcomes really was to the point. Then I remembered the species mingling index that was originally devised by my mentor Prof. Klaus von Gadow back in 1993. Of course, this index was about spatial species mingling, so it should actually suit the research question quite nicely. Still, I needed to establish a relationship between species mingling and size. That line of thinking eventually let me to logistic regression, since I recalled that we often model tree selection probabilities (for thinnings) using logistic regression, where size is an important explanatory variable. Tree mortality modelling is a related topic, where logistic regression is often applied. However, the discrete mingling index can take k + 1 different values depending on the number of nearest neighbours, k. For using logistic regression I thus had to convert the mingling index to a binary variable. Instead of using only k = 1 neighbour I stuck to the idea of including a slightly larger neighbourhood for a better description of species mingling. Finally – after much thinking and trial calculations – I settled on the idea of using k = 3 neighbours leading to four discrete mingling values, i.e. 0, 0.33, 0.67 and 1. I argued that a situation where no or only one neighbour is of a different species can be summarised as “low mingling”. On the other hand, values of 0.67 and 1 indicating two and three heterospecific neighbours describes a situation of “high mingling”. A few validation checks have later shown that this was a good choice. My definition of low and high mingling also allows a straightforward mapping and detection of clusters of high and low mingling in in a forest, see Fig. 2 in the publication. I still remember that this basic idea came to me out of the blue while actually travelling between Umeå and Göttingen. In January 2017, I gave a first talk on this research to a larger audience at Dresden Technical University (Germany). The discussion following my presentation was interesting and varied. There was some scepticism in the audience, as you often get with new ideas, particularly with regard to the finding that the investigated trend should really hold for many different forest types. This kind of scepticism also came up in the review process. It took much discussion and re-wording to bring the point of the paper across in an appropriate way. Overall we found significant support for the expectation that large trees and trees growing at low local densities often have a tendency towards high species mingling. An explanation for this can be the aforementioned theories, but also disturbances and even forest management. We also found that size differentiation and species mingling are strongly related in local neighbourhoods. This is a very interesting and useful finding for conservation. Now it would be great to follow these relationships up in detailed studies of specific forest ecosystems using spatio-temporal data. And while working on this topic two new research ideas came to me out of nowhere. An MSc student at Umeå is currently pursuing one of them and the other one is still sitting in my folder of new ideas. Perhaps I will post their background stories here one day, too, who knows. In one of my previous posts in this blog I have talked about research into human tree selection behaviour. Since the previous post was published we have learned new things, which highlighted how complex and fascinating this research is. Experience is for example a term that often comes up in the context of human resources. It is generally perceived as something positive that complements knowledge received through education. In some countries there is even the widespread believe that experience can compensate for a lack of education, but I tend to disagree here: The value of experience made in a certain field much depends on the prior knowledge received from school or university education. The more you know about a certain field the more you tend to gain from experience. However, my recent work with Lucie Vítková has shown, that experience sometimes can also prevent people from taking in new skills as part of training: People with many years of practical work and associated experience are somewhat unwilling to leave their comfort zone and to try new ways. Our research also showed that people with little experience on the other hand tend to be open to new suggestions and are ready to implement them. Research on human tree selection behaviour has a lot to do with assessing agreement. The question of agreement is crucial to the forest industry, perhaps today even more so, as environmentally friendly ways of forest management are meant to maintain biodiversity and to mitigate adverse effects of climate change among other things. It is therefore important to know how much agreement and chance there is when professional staff mark trees for various purposes. Outside forest and agricultural sciences there is a large body of literature dealing with agreement. In medical science and in psychology there are many applications where humans vote for something or rate items that they are confronted with. Even the binary case with “1” meaning “approval” or “selection” and “0” denoting “rejection” is quite common. A popular statistic used to quantify agreement is for example Fleiss’ kappa that was designed to express agreement in a single number based on matrix data. This statistic has become a kind of standard, although there are also other alternatives. However, expressing human behaviour in a single number is difficult. The more we look into this matter, the more we understand how complex this type of behaviour actually is. Apart from a large data matrix with trees in rows and raters in columns there is an interaction between raters and trees that is hard to disentangle. We can distinguish between an active behaviour of the raters and a passive rater behaviour, which is influenced by the trees they rate. The former is easier to understand and describes the marking behaviour of each rater, comparatively independent of the trees, i.e. whether they tend to mark many or few trees. The passive tree selection behaviour is consciously and subconsciously influenced by the trees, i.e. some of them are more attractive to one rater than to another. Both processes influence the level of agreement. A good characteristic should take both processes into account to arrive at a balanced assessment of agreement. However, currently it is mostly the passive behaviour, which the existing characteristics including Fleiss’ kappa quantify. My group and I are currently looking more into these processes in order to better understand them and to find ways to quantify them. This is an intriguing quest, since this work also tells us more about ourselves and about how our mind functions. j denotes the jth nearest neighbour of plant i. The expression 1(A) = 1, if condition A is true, otherwise 1(A) = 0. In principle, k can take any number and can also vary between plants of the same population or research plot. However, for convenience k has often been set to a fixed value of 3 or 4, but this convenience lacks scientific justification. 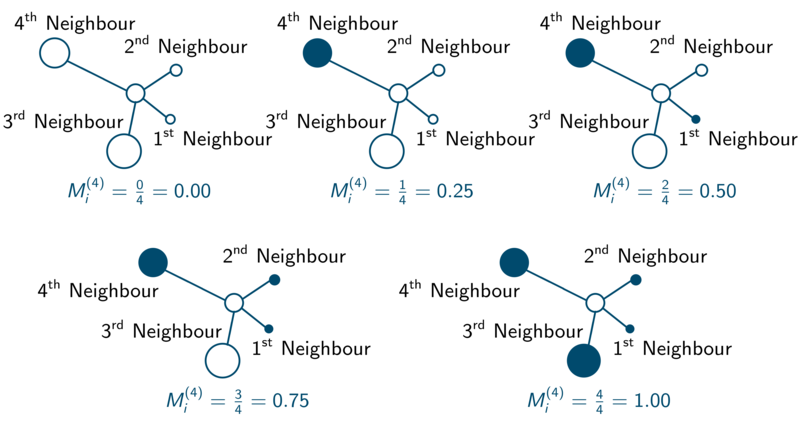 The mingling index is defined as the mean fraction of plants among the k nearest neighbours of a given plant i with heterospecific neighbours. An early strategy and benchmark for quantifying spatial species mingling is Pielou’s segregation index (Pielou, 1977) comparing pairs of points formed by the locations of an arbitrary plant and its nearest neighbour. For all plants in a certain observation window (e.g. a research plot) these pairs are determined. Pielou (1977) defined the segregation index as the ratio of the observed probability that an arbitrary plant and its first nearest neighbour are conspecific and the same probability with independent species marks (i.e. a completely random dispersal of species). This segregation index was originally developed for bivariate species patterns and describes the neighbourhood structure of a subject plant of one species in terms of others. An individual has a high degree of mingling if its neighbourhood is highly diverse, i.e. if many heterospecific neighbours are located in its vicinity. The opposite of a largely conspecific neighbourhood is referred to as segregation. Gadow (1993) and Aguirre et al. (2003) extended this concept to general multivariate species patterns involving k neighbours. Species diversity is an important and most commonly considered aspect of biodiversity worldwide (Kimmins, 2004). As a part of species diversity, spatial mingling of plants concerns the question of how plants of the same and different species mix in space. This refined concept extends beyond the idea of species richness to take the individuals’ perception of local diversity into account. Spatial mingling specifically relates to the microstructure of ecosystems, particularly to neighbourhood relationships, which play a vital role in plant ecology. These discrete mingling values can be used to construct an empirical mingling distribution, which collects the relative numbers of plants with one of the k + 1 values and presents them as bars. It is also possible to estimate arithmetic mean mingling, , at population level using an appropriate edge correction method such as NN1 (Pommerening and Stoyan, 2006). Empirical mingling distributions and mean arithmetic mingling can also be calculated separately for individual species populations of the same plant population. with s, the number of species, N, the total number of plants in the observation window and , the number of plants of species i.
I refer to this index as species segregation index. Consequently, M = 0 if the species marks are independent or random. If the nearest neighbours and plant i always share the same species, M = 1 (attraction of similar species, segregation in Pielou’s terminology). If all neighbours always have a species different from that of plant i, M = -1 (attraction of different species, aggregation in Pielou’s terminology). To calculate M two auxiliary functions are necessary, the first one calculating EM and the second one calculating the Euclidean distance. The main calculations are done in the following loop and additional lines of code. Here the NN1 edge correction is used for estimating arithmetic mean mingling. Aguirre, O., Hui, G. Y., Gadow, K. and Jiménez, J., 2003. An analysis of spatial forest structure using neighbourhood-based variables. Forest Ecology and Management 183: 137-145. Gadow, K. v., 1993. Zur Bestandesbeschreibung in der Forsteinrichtung. [New variables for describing stands of trees.] Forst und Holz 48: 602-606. Kimmins, J. P., 2004. Forest ecology. A Foundation for sustainable forest management and environmental ethics in forestry. 3rd edition. Pearson Education, Inc., Upper Saddle River. Lewandowski, A. and Pommerening, A., 1997. Zur Beschreibung der Waldstruktur – Erwartete und beobachtete Arten-Durchmischung. [On the description of forest structure – Expected and observed mingling of species.] Forstwissenschaftliches Centralblatt 116: 129-139. Pielou, E. C., 1977. Mathematical ecology. John Wiley & Sons, New York. Pommerening, A. and Stoyan, D., 2006. Edge-correction needs in estimating indices of spatial forest structure. Canadian Journal of Forest Research 36: 1723-1739. The formula quantifies the sum of the basal areas of all trees that are larger or equal in basal area compared to that of a given tree i at time t. It is the complement value of the basal area percentile of tree i denoting relative dominance, where G(t) is basal area per hectare of a given forest stand at time t. Basal area of an individual tree is the cross-sectional area of its stem usually measured at 1.3 m above ground level. For convenience basal area is often calculated from stem diameter using the area formula of a circle. Basal area per hectare is a density measure taking both number of trees and their sizes in a certain area into account. BAL is related to available light, since with increasing basal area of larger trees there is less light available for smaller trees. In a sense BAL is a surrogate for light measurements with the benefit that stem diameters and basal area are easier to measure. Basal area in larger trees is also referred to as overtopping basal area suggesting the nature of a kind of competition index. In fact this was precisely the context in which Schütz (1975), Wykoff et al. (1982) and Wykoff (1990) suggested this measure. RS(t) is referred to as relative spacing, another density measure linking average growing space with top or dominant height, , a characteristic of growth and site quality. Top or dominant height is often calculated as the mean height of the hundred largest trees per hectare. BALMOD(t) is useful in situations where a competition index is needed for fitting a function estimating growth rates from a multiple number of different time series scattered across a certain larger geographic entity, for example a country or even a continent. In such a context, Schröder and Gadow (1999) found that BALMOD(t) is superior to BAL(t). Other authors have applied the BAL concept to crown variables and Burkhart and Tomé (2012, p. 202ff.) give a good overview. a, b and c are regression coefficients. However, it is best to set c to a fixed value between 1.5 and 4. The larger the value of c the stronger the saturation effect towards the lower range of BAL and the larger the value of the growth compensation point. For comparisons within the same time series it is probably best to set c to an optimised constant value. A value of c = 2 is a good starting point. 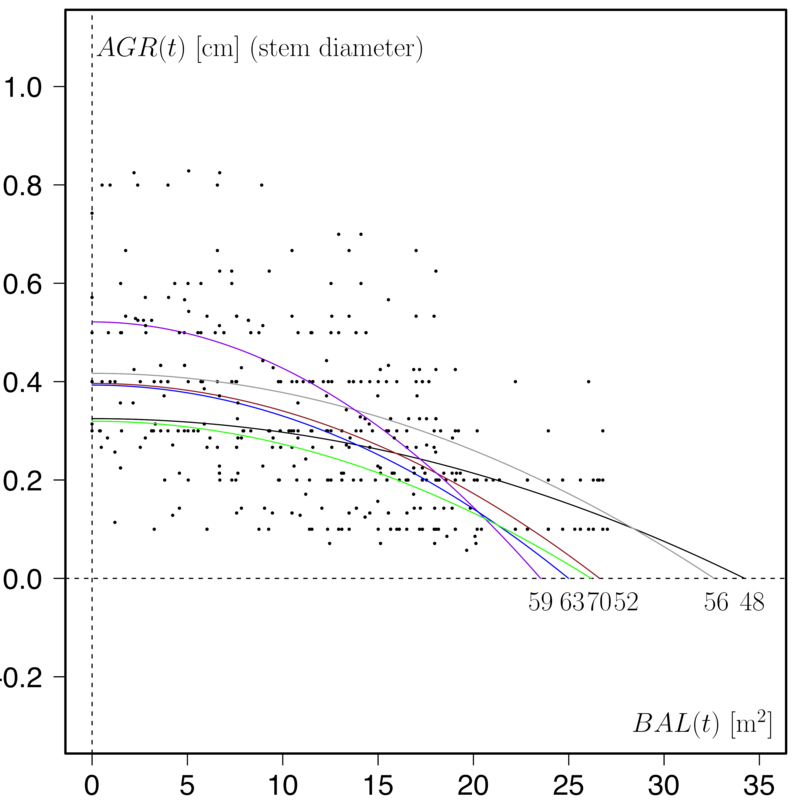 The regression coefficient a is then the intercept describing the stem-diameter growth rate of large, dominant trees (almost open-grown trees) whilst the function has a root at . This is the growth compensation point in analogy to the light compensation point. The growth compensation point is an expression of carrying capacity and site quality. The graph shown above is an example of this relationship for the Sitka spruce time series 2068 in the Brecon Beacons (Wales, UK, between 1961 and 1966). Such graphs can offer valuable insights of the growth patterns of forest ecosystems in relation to density and size. Comparisons between different forest stands and tree species in the same stand (Schütz and Pommerening, 2013) are helpful in understanding the relationships between environment, size and growth. The graph below, for example, has been produced using the data from the birch-plantation time series Bagshot (England, UK). The data points represent the total time series. For fitting the saturation curves the growth data of only two subsequent survey years were used. Model parameter c was set to 2. The numbers under the dashed horizontal line give the base calendar years of the corresponding survey period. Apparently, growth compensation point and maximum growth rate (parameter a) vary throughout the years with hardly any particular pattern. Partly this can be attributed to forest management activities and partly to changing environmental conditions. 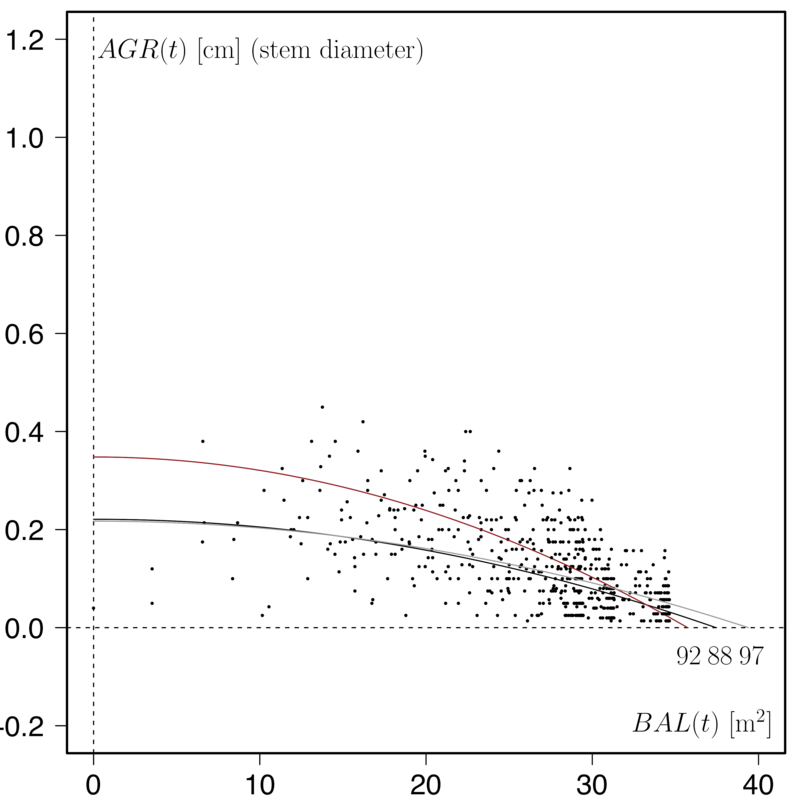 In natural, unmanaged forests, such as an Interior-Douglas fir stand in the Alex Fraser Experimental Forest (plot 3, see graph below) in British Columbia (Canada), the saturation curves and the growth compensation points are typically much closer together and show a stronger saturation effect. Another way to illustrate and analyse the BAL – AGR relationship is to use the growth dominance characteristic that I introduced in an earlier blog in 2015. As mentioned above, BAL(t) of an individual tree can also be used as a competition index for estimating growth rate. In that case basal area of larger trees is one of a number of explanatory variables that is either used directly in a growth function or as part of a modifier function (usually an exponential function). In the potential-modifier approach (see Weiskittel et al., 2011, p. 89ff. ), first potential growth rate is estimated (e.g. growth of open-grown trees or the growth of a certain, upper percentile) and then reduced by a number of modifiers, one of which usually is competition. “dataOneYear” is an arbitrary data frame, “dataOneYear$DBH” is a vector of stem diameters measured in cm. “plotSize” is the area of the forest stand in square metres. Burkhart, H. and Tomé, M., 2012. Modeling forest trees and stands. Springer, Dordrecht. Schütz, J. P., 1975. Dynamique et conditions d’équilibre de peuplements jardinés sur les stations de la hêtraie à sapin. Schweizerische Zeitschrift für Forstwesen 126: 637-671. Schütz, J.P. and Pommerening, A., 2013. Can Douglas fir (Pseudotsuga menziesii (Mirb.) Franco) sustainbly grow in complex forest structures? Forest Ecology and Management 303: 175-183. Schröder, J. and Gadow, K. v., 1999. Testing a new competition index for maritime pine in northwestern Spain. Canadian Journal of Forest Research 29: 280-283. Weiskittel, A. R., Hann, D. W., Kershaw, J. A. and Vanclay, J. K., 2011. 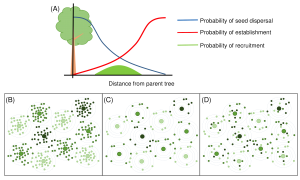 Forest growth and yield modeling. John Wiley & Sons, Chichester. Wykoff, W. R., Crookston, N. L., Stage, A. R., 1982. User’s guide to the stand prognosis model. USDA Forest Service, Intermountain Forest an Range Experiment Station, Ogden, General Technical Report INT-133. Wykoff, W. R., 1990. A basal area increment model for individual conifers in the northern Rocky Mountains. Forest Science 26: 1077-1104. Growth functions in general describe the change in size of an individual or population with time (Burkhart and Tomé, 2012). Assume that is a tree growth variable, e.g. tree total height or tree volume, and is the maximum value this growth variable can take (in absolute terms for a given species in general or for a given species on a given site) then the term is a modifier reducing the maximum growth variable to its current state at time . 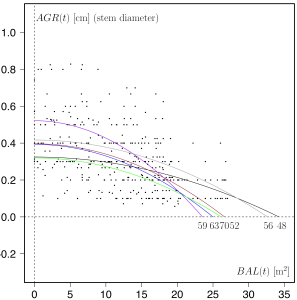 is an empirical growth parameter scaling the absolute growth rate. The empirical parameter is related to catabolism (destructive metabolism), which is said to be proportional to an organism’s mass. Therefore it is often restricted to a value of three for theoretical, biological reasons. The Chapman-Richards growth function can be applied to both, individual organisms as was well as to the growth of whole populations and describes cumulative growth over time. As such the function has an inflection point and an upper asymptote at reflecting a so-called sigmoid growth curve typical of growth processes, which are influenced by biotic and abiotic factors. The Chapman-Richards growth function is based on the seminal work by Bertalanffy for animal growth and was published by Richard in 1959 and Pienaar and Turnbull (1973) introduced it to forestry applications. The model has a reputation of being very flexible on the slight expense of biological realism. It is valued for its accuracy, although there can be problems in the process of parameter estimation when is allowed to vary (Clutter et al., 1983; Pienaar and Turnbull, 1973; Zeide, 1933). 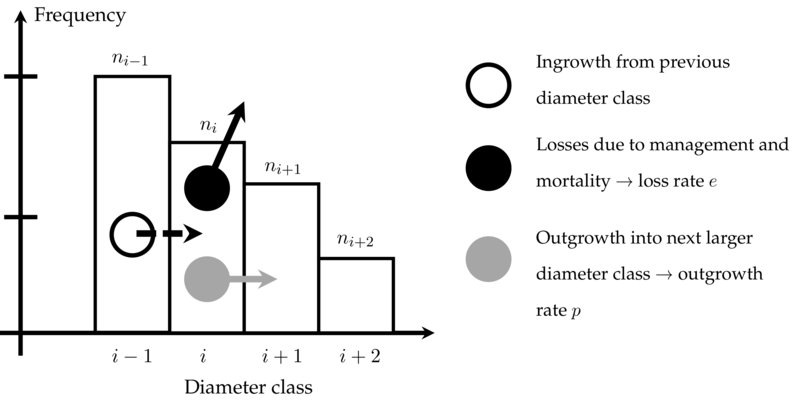 The Chapman-Richards growth function has been a popular model for describing the growth of various tree and forest stand growth variables, e.g. tree and stand height, diameter at breast height, basal area and volume. As such it has been and is still widely used in many empirical forest growth simulators, particularly where the accuracy of model prediction is crucial (Zeide, 1933). The Chapman-Richards growth function has been used extensively to model site index development, i.e. the mean height development of the most dominant trees of a forest as a population characteristic for describing site quality (Burkhart and Tomé, 2012), leading to a so-called polymorphic height growth model. Assume you have access to sample data providing several combinations of a growth variable, e.g. 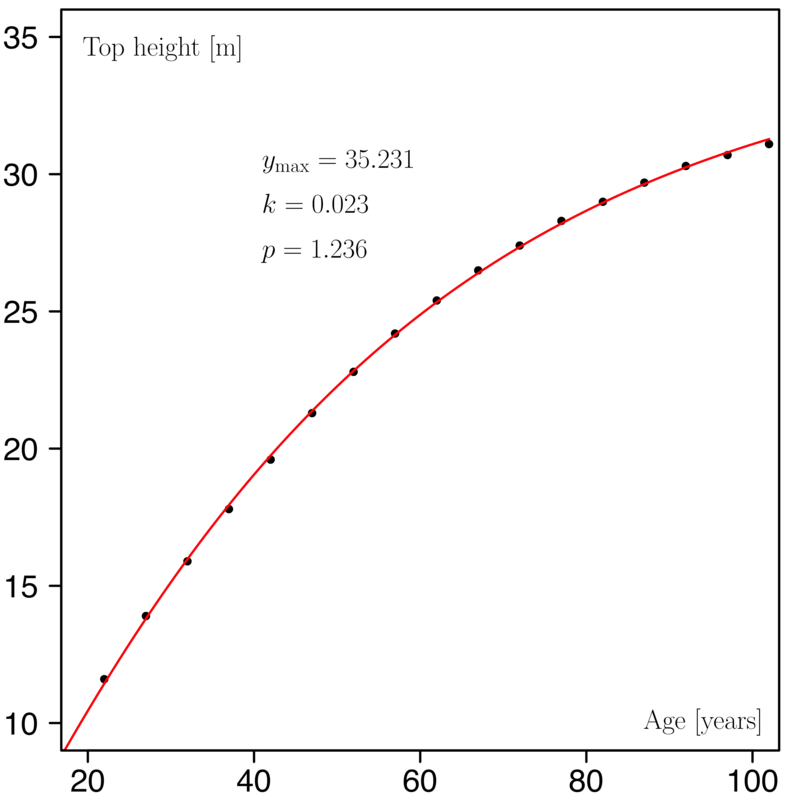 tree height, and age. Using nonlinear regression methods you can estimate the parameters of the Chapman-Richards growth function. After estimating the growth parameters the model can be used for interpolation and for predicting past and future growth. where the fracture constitutes a growth multiplier (Pommerening and Muszta, 2016) and the aymptote disappears. 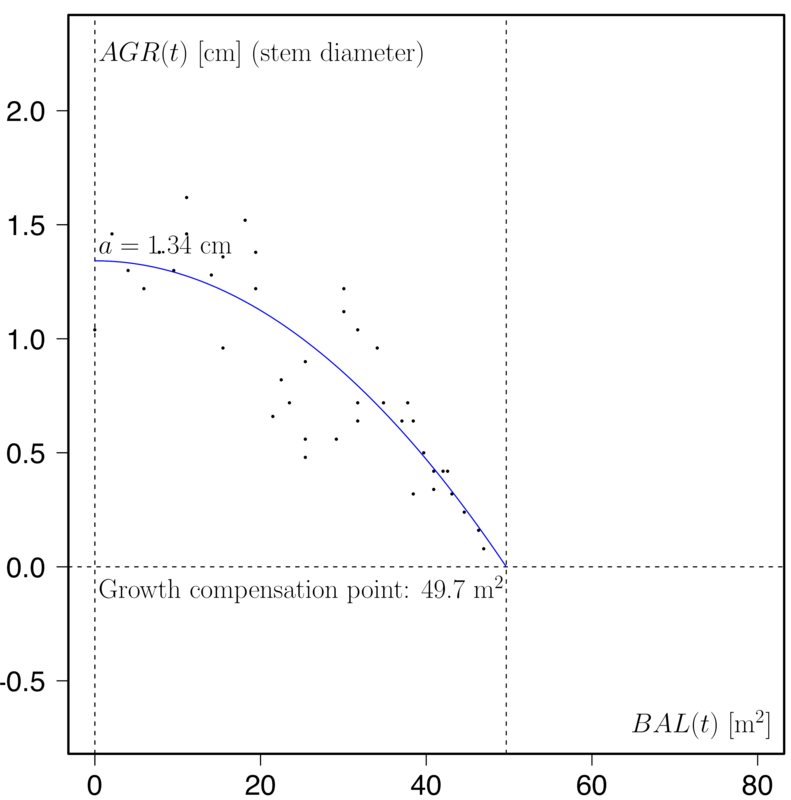 The algebraic difference form allows estimating the current value of a growth variable from a value in the past (anamorphic model). In R it is quite straightforward to estimate the parameters of the Chapman-Richards growth function through nonlinear regression. First we need some sample data and I have taken pairs of top height (the mean height of dominant trees, a population characteristic) and the corresponding age (assuming an even-aged forest) from a British yield table. In more interesting applications, similar data would naturally stem from field observations. # Using some data from the British yield table for Scots pine, YC 14. Then we load a package for robust regression (as we know that the Chapman-Richards model can sometimes “play up”). 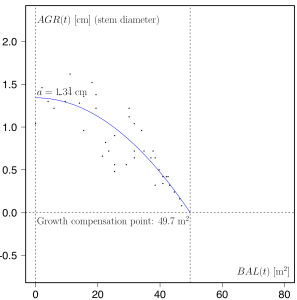 It is always a good idea to check the value of parameter against the maximum value of the growth variable: Both values shouldn’t be very far off, because is the upper asymptote of the growth function. Clutter, J. L, Fortson, J. C., Pienaar, L. V., Brister, G. H. and Bailey, R. L., 1983. Timber management. A quantitative approach. John Wiley & Sons, New York. Zeide, B., 1993. Analysis of growth equations. Forest Science 39: 594-616.